The Reaction: Powell: born-again maverick? 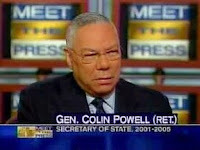 But I have to give Powell a modicum of credit for his appearance this morning on Tim Russert’s Meet the Press. Asked whether he would endorse any presidential candidates at this stage, Powell wisely said, “Oh, not yet. It’s too early.” What was more interesting, though, was his answer to Russert’s question about whether he would “support the Republican” in the 2008 race. Powell: “It’s too early. ... I’m going to support the best person that I can find who will lead this country for the eight years beginning in January 2009. As Joe Sudbay of AMERICAblog points out, such coyness about party choice is “just not done in GOP world. Loyalty comes first.” Apparently, Powell didn’t get the memo. Or maybe he’s just seen what havoc can be wrought through loyalty. View the video for yourself here. When I was growing up as a child I was proud to say that I lived in a republican household. It wasn't until I moved out and was reintroduced to politics that I realized the republican party I thought I knew had morphed into something ugly. I have a feeling Powell's feeling the same way right now. I'm glad to see he's back and decidedly nonpartisan.